Want to learn to paint? I offer classes and private tutoring to help you enjoy your creativity in a friendly environment. Gain painting skills and knowledge so you can create paintings to be proud of! My classes are suitable for all levels of skill, from beginners to those who want to improve their painting and take it to a professional level. Bookings are essential. Feel free to call and ask questions to find out more 0412 694 674 or contact me via the form below. 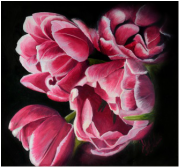 I have an extensive teaching background and would love to help you in your painting journey. ​Currently, I offer the following classes. Enjoy painting through a progression of fun projects suitable for complete beginners or more experienced painters. Choose to work in oil, acrylic or watercolour. Reference material provided or work from your own. You’ll learn how to explore your personal vision and style, while developing painting technique, colour confidence and design skills.